April 11 is World Parkinson’s Day and North Shore Private Hospital held a fundraiser to support the Shake it Up Australia Foundation and the work they do for Parkinson’s research. Sydney DBS organised a cupcake stall to raise funds and were well supported from visiting patients, families and staff from NSPH. Clinical Nurse Educator Morena Hill and Nurse Unit Manager from the Neurosurgical Ward Karen Morrison manned the stall and provided helpful information on Parkinson’s disease for those who stopped by to donate. If you would like to donate to Shake it Up Australia foundation to support the great work they do, head to https://shakeitup.org.au/make-donation/ Why donate to Shake it Up? 100% of your donation goes to research targeted at finding better treatments and ultimately a cure for Parkinson’s Disease. 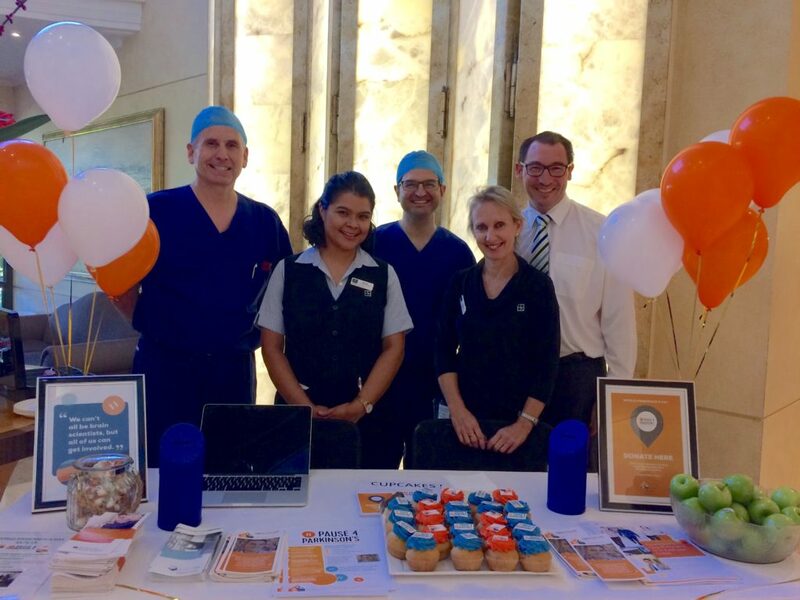 Sydney DBS Neurosurgeon Dr Raymond Cook and Neurologist Dr Paul Silberstein visited the World Parkinson’s Day fundraiser to encourage visitors to donate to this great cause and are pictured with Morena Hill, Karen Morrison and NSPH CEO Richard Ryan.